Cycone Power Blenders are available in 6 sizes. These machines are used for mixing all types of powder products including detergent powders. They are characterized by numerous features which make for easy processing, quick cleaning and lower production costs. The Cycone Powder Blender is a vertical conical screw blender which easily handles all types of powders including powder detergents. The rotating screw does not have a bottom support thereby eliminating any dead spots or difficult areas to clean. Discharge of material is fast and simple. Rotating with the mixing screw is a spray nozzle which allows the user to inject liquid ingredients into the batch. Materials of construction are carbon steel or stainless steel as required. The Cycone Powder Blender can be manufactured with or without a cooling/heating jacket. For more intense mixing, a sidewall mounted lump breaker can be incorporated. 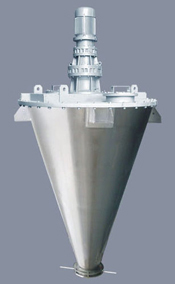 The product outlet is through the bottom, and since the mixing vessel is conically shaped, product discharge is fast and complete. Similarly, the design lends itself to exceptionally easy and fast cleaning.